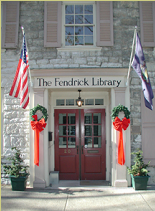 The Fendrick Library is a nonprofit association formally established in 1962 to continue the community library tradition that had been operating in Mercersburg since 1913. The current location in the historic Parker House was a gift form Mrs. Virginia Jamison Grosscup, her father Arthur F. Humphrey, and her brother Arthur F. Humphrey, Jr. in November 1961. The donors, decendants of Christian Fendrick and his wife Virginia Shannon Fendrick, also gave funds to aid in the restoration of the property at 20 North Main Street. Thus, in 1962, the Mercersburg Library Association was established and incorporated as a 501(c)3 organization. The new location was named the Fendrick Library, in honor of Mrs. Fendrick (1863-1943), a local historian and genealogist. Mrs. Fendrick was the editor for Old Mercersburg and wrote the book Revolutionary War Soldiers of Franklin County. Her genealogical research fills 25 notebooks and is housed in the history and genealogical section of the Library. Prior to its formal organization, a library operated in various community locations. In July 1913 the Mercersburg Woman's Club voted to establish a free library in the town. The following September, a book social was held, and each member donated a book to the cause. The new library opened in the Scheller building on Center Square with 400 donated books, an unabridged dictionary and a set of encyclopedias. The use of the library extended to the surrounding small towns and communities. By 1925, the library was moved to the Fallon Building on West Seminary Street, where it remained for the next ten years. in 1935 the library was moved to the Town Hall where it continued to grow. By 1959 the library had 7,200 books available for its patrons. The stone house that the Fendrick Library occupies today was built in 1788 by Captain Robert Parker (1754-1799), a veteran of the Revolutionary War. As a young man of 23, Parker enlisted at Philadelphia on April 28, 1777, and was commissioned a Second Lieutenant in the Second Continental Artillery and later promoted to Captain. A member of General Washington's staff, Parker became a friend of the Marquis de Lafayette and they fought together at the Battle of Brandywine. A prized possession of Parker's decendants was a yellow satin vest, given to the Captain by Lafayette as a token of his esteem. 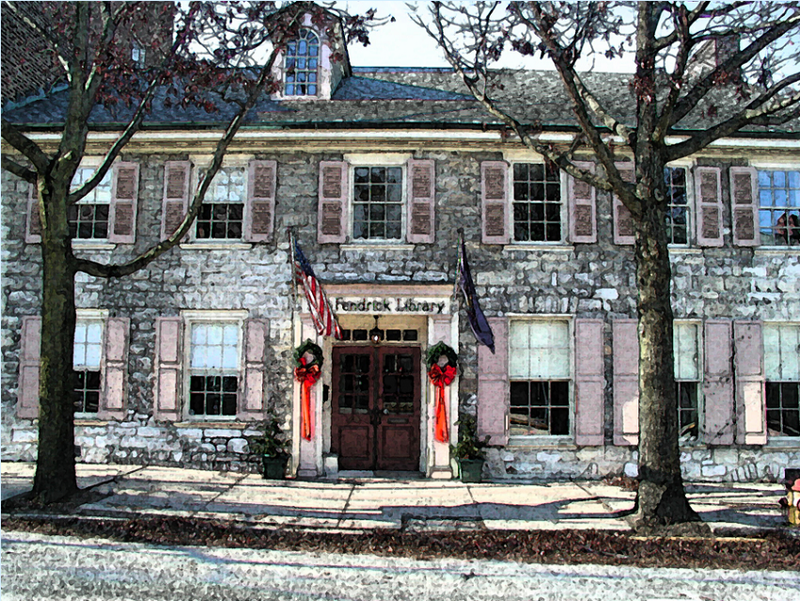 After the war, Parker settled in Mercersburg where he married Mary Smith, a daughter of Squire William Smith, founder of Smith's Town, which became Mercersburg. Parker's home was built both as a residence and for business. Great care was taken in the interior details - the window panes were brought from France. The carvings of mantels and cupboards, the scroll work on the stairs, and the turned balusters are the work of skilled artisans. In planning for the new addition to the Fendrick Library, the Board is adding a wing in keeping with the historic character of the structure. The larger library to better serve the needs of this growing region, will be completed in 2011, thanks to our generous donors. This stylized rendering of the Fendrick Library is available to purchase. Printed on 8 X 10 high quality paper, it is suitable for framing. The cost is $8.00 per print at the library. 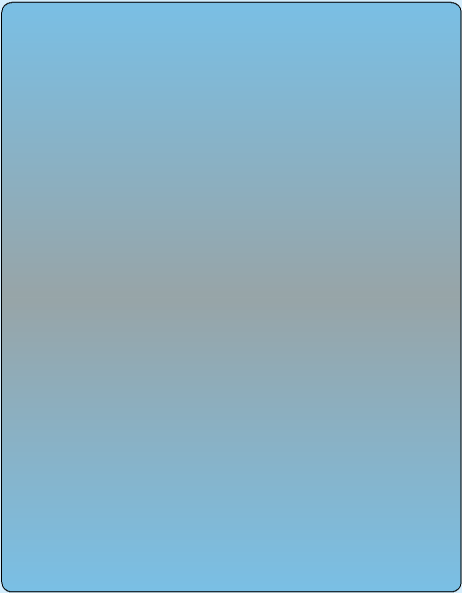 Add $2.00 shipping and handling to have a print mailed to you. Virginia Shannon Fendrick had deep roots in Mercersburg, Pennsylvania and the surrounding communities. She was born June 27th, 1863, the daughter of Daniel Miller Bowles Shannon and his wife, Magdalena Angle Shannon. The family included a sister, Antoinette, and brothers, Oliver and William. They lived most of their growing up years at the William Smith house on the corner of Main and Oregon Street. She married Christian F. Fendrick, son of Philip and Christina Steiger Fendrick, a well known and respected businessman of Mercersburg. They had three children, Raymond, Margarite and Percy. Her interest in local history and family genealogy developed early and continued throughout her life. She was a charter member of the Mercersburg Woman's Club and charter member of the Franklin County Chapter of the Daughter's of the American Revolution (DAR). As Chairman of the DAR Genealogical Records, she compiled detailed records on Franklin County soldiers serving during the American Revolution. Her research was published by the DAR as "Revolutionary War Soldiers of Franklin County." 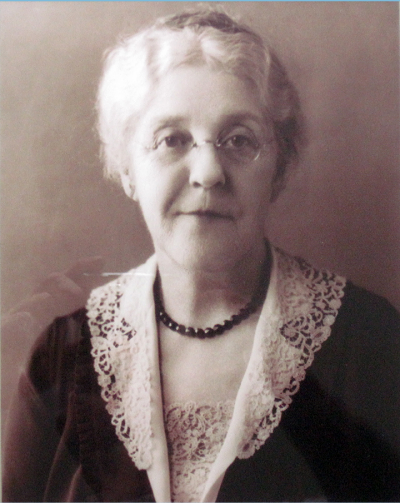 Mrs. Fendrick was honored for her work in genealogical and historical research by being included in the 1932 edition of The Handbook of American Genealogy of Chicago. Mrs. Fendrick served as editor for Old Mercersburg published by the Mercersburg Woman's Club in 1912. Her sister Antoinette assisted her in this work. She also researched many of the families in Franklin County, Pennsylvania and Washington County, Maryland, and kept her notes in carefully numbered notebooks. Many of her records include material from early wills and deeds filed at the courthouse in Chambersburg, Pennsylvania. To gather this information, she had to copy the material by hand at the courthouse and then type it at a later date to place in her notebooks. She was carefull to list volume and page numbers as well as all pertinent names and dates. Mrs. Virginia Shannon Fendrick's genealogical research fills twenty five notebooks and is currently housed at the Fendrick Library.